Lendxcoin (Xcoin) is a kind of digital cash applied in P2P lending via online network which is based on Blockchain platform through a smart contract. Lendxcoin will be a bridge linking lending and borrowing of members all over the world without any mortgages. Lenders and borrowers are connected to each other quickly and easily, and have not to take much time and carry out complicated procedures like at traditional banks. Note: The bounty campaign ends in few days. Those who haven’t verified the account do it now by clicking My Account -> KYC Verification (on dashboard). You can transfer Xcoin to your wallet after being verified successfully. Luckygames | The 50,000,000,000th Bet Giveaway is Finished! We are about to hit a big milestone of 50 Billions Bets. 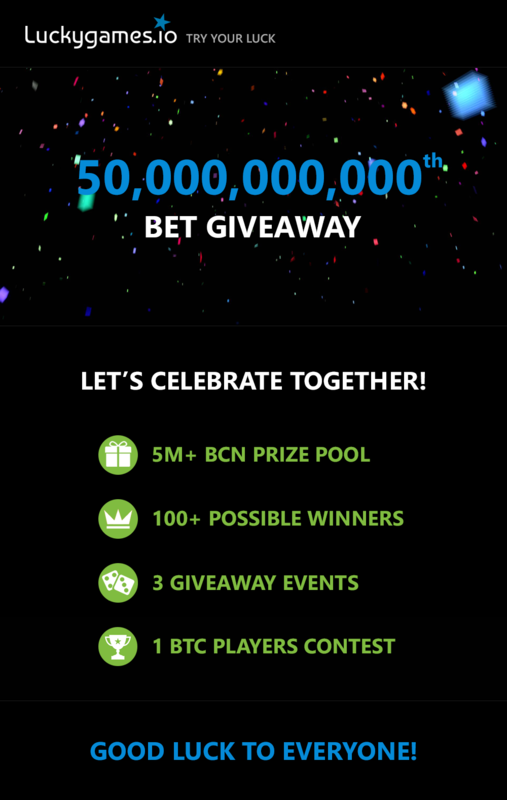 Without your support, this would not have even happened and we want to celebrate this HUGE Event for LG by inviting all of you to join our next BIG 5,000,000+ BCN Giveaway to the upcoming 50,000,000,000th Bet. You need to hit 2 times in a row the same multiplier (3.00x OR 4.00x OR 5.00x) in Cells game as fast as you can. The first 50 winners will take 50,000 BCN and 5 Days LEGEND. The event will start after 50,000,000,000 bet, so watch out! Post both of your bet ids in the comments bellow using this format. The bets made before 50,000,000,000 bet won't be taken. All coins (except LUCKY-tokens) can be used to place bets. No minimum amount. Players who win in the 1st event are NOT able to participate. You need to hit 0 (Zero) lucky number (result number) 2 times in a row (one-by-one) in Roulette game as fast as you can regardless of whether the bet is win or loss. The first 50 winners will take 50,000 BCN and 5 Days LEGEND. The event will start after the 50,017,000,000th bet. The bets made before the 50,017,000,000th bet won't be taken. Bytecoin (BCN) can be used only to place bets. Minimum bet amount - 1 BCN. 50,000,000,000, 50,000,000,001 and 50,000,000,002 bets. If you hit 1 roll number, you win 20,000 BCN and 3 DAYS LEGEND! If you hit 2 roll numbers, you win 30,000 BCN and 5 DAYS LEGEND! If you hit 3 roll numbers, you win 50,000 BCN and 7 DAYS LEGEND! Next bet id will be taken, in case of 2 same roll numbers,. Players (Wagering) Contest with 1 BTC Prize Pool will be held on the next day since we hit the 50th billion bet. Follow the Contests page ! SPRTSC got 200% hike within hours..
Sprouts classic as down earlier about price price of 100 UDoge. now its increasing 211% within hours in tradesatoshi. SPRTSC listed to tradesatoshi few days ago I think and price goes down . now its recovering its value. People Can check on given link . this is from tradesatoshi . The Day before it was 110 MicroDoge. now today it is 315 Microdoge and still people buying .